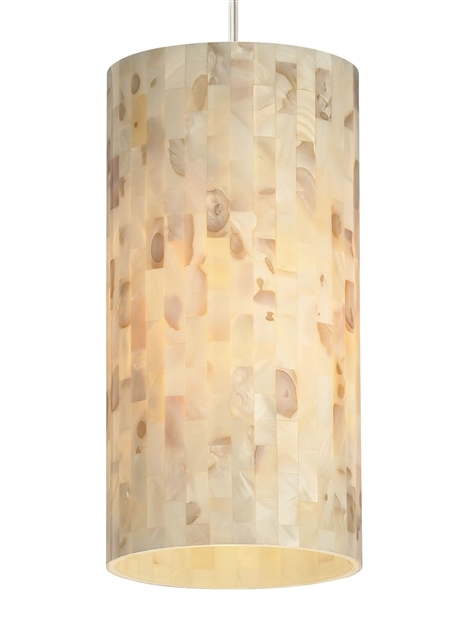 The Playa pendant by Tech Lighting is an elegant multi-toned shade that is composed of natural shell panels that are burnished to remove rough edges. Artisans polish and cut to size the meticulously adhered shell panels to an inner glass cylinder. The modestly sized Playa pendant is ideal for kitchen island task lighting, bedroom lighting flanking an end table or dining room lighting. The Playa is available in three neutral yet modern colors and come with your choice of four on-trend hardware finishes. Also available by Tech Lighting is the Playa 2KD, Playa Flush Wall and Playa Wall Sconce, simply search for the Playa Pendant to find its closest relatives. The Playa ships with your choice of either energy efficient LED and halogen lamping, both lamp options are fully dimmable to create the desired ambiance in your unique space. For a list of compatible dimmers please refer to dimming chart for more information. Includes low-voltage, 50 watt, 750 gross lumens, halogen bi-pin lamp. LED includes 120 volt 8 watt, 500 gross lumen, 3000K, replaceable SORAA LED module. Ships with six feet of field-cuttable cable. Dimmable with low-voltage electronic dimmer (based on transformer).